The U.S. stock market and all MLP prices got clobbered in January and early February this year, only to come roaring back in short order to near break even levels as of today. In fact, greatly oversold MLP prices since the bottom have outpaced overall stock market gains, as has occurred at almost every important stock market bottom, which usually preceded good economic gains over the years. Is this rally a sign that low interest rates and economic stimulus are going to kick in near the end of an almost seven-year 'economic recovery' post Great Recession? Notwithstanding major economic shocks like wars or other major financial disruptions, most economic recoveries end when manufacturing capacity is constrained or labor gets too tight causing Fed tightening. It doesn't seem like we are there yet. First, the U.S. economy continues its slow growth rate of maybe 2% despite low interest rates and reasonably healthy income growth. Slow historically, but better than a recession. Economists have long believed that long-term, real GDP growth is limited to growth in labor productivity, plus growth in the labor force, both of which are about 1/2% each, for a total of only 1% real economic growth per year. Some developed countries like Japan, Germany, and Russia have even less potential due to actual declining population rates, while many of the faster growing population areas, like in South America, Africa, and the Middle East, have serious financial issues limiting their potential growth. And, even though exports are a small part of the U.S. economy, other countries are far more dependent. Where is global leadership when you need it? Since global growth is so limited for now, it's no wonder countries try for economic trade advantage by lowering their currencies to increase exports and decrease imports. But it is a zero sum game if the pie does not get bigger!!! Trade wars can have serious consequences, as Herbert Hoover discovered. That is likely why Central Bank interest rate policy is so important and shows up first in currency movements and in the stock market that often precede economic movements. The U.S. is still unquestionably the leader. 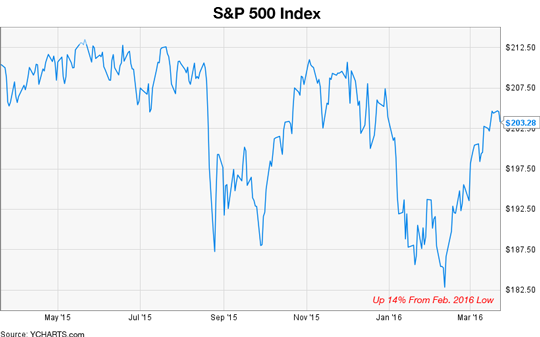 In a slow economy, the 'hot money' moves stocks up and down quickly. 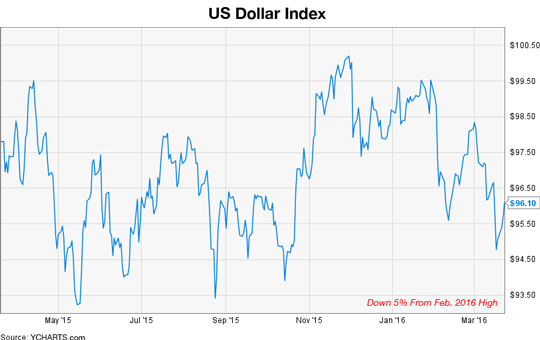 Look at the attached recent charts of the U.S. Dollar and the stock market. The recent U.S. Dollar decline of about 5% has also likely been very important in price recoveries in stocks, gold, oil and many other commodities. True recoveries or 'dead cat bounces'? I don't like that expression either, but it is descriptive. 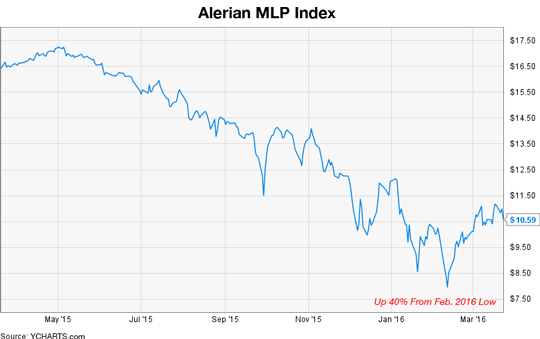 Next look at the chart of the Alerian MLP Index. 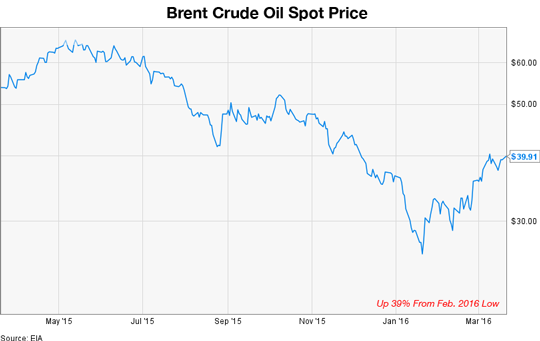 It has recovered about 40% from recent lows. The Index is a mixture of many commodity-related stocks along with normally more stable midstream transportation and terminalling issues, plus even more supposedly stable wholesale marketing oriented MLPs. True, some are suffering from over expansion paying high multiples for acquisitions, and, in some cases, creating increased leverage to maintain dividends, etc. Leverage is terrific in up markets, but painful in down markets. Despite the mixture of companies, the overall Index, AMLP, outperformed the oil price recovery, which outperformed the overall stock market, which outperformed the 'desirable' losses in the U.S. Dollar. Oil often seems to be just another financial market, especially when you look at the volume of trading of daily futures. If only the timing of these swings could be predicted. All these markets have had very substantial moves in an incredibly short period of time, although some like stocks have been in a longer trading range. Right now, volatility wins. Historically, sharp fast moves preceded very large moves, either higher or lower. Which way are you thinking?